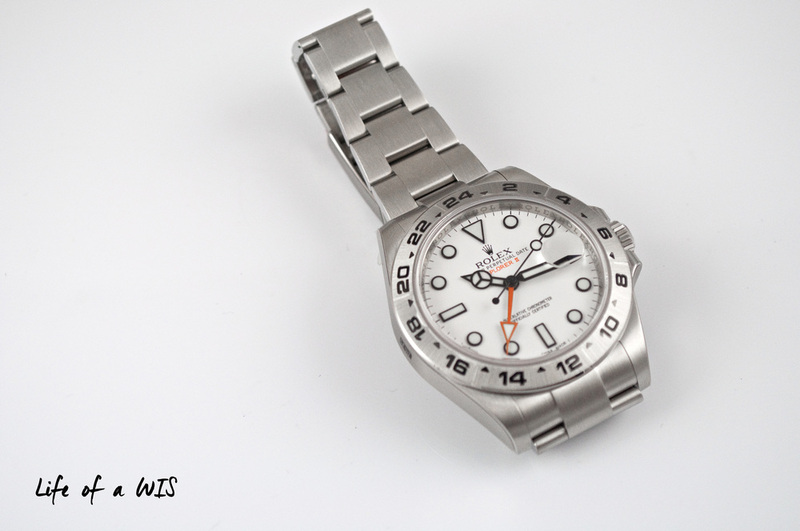 Picking which stainless steel sport Rolex to purchase is no simple task. For the most part, they are quite similar, yet so different. To the WIS, they are different enough that we could easily justify owning each and every model... but to the rest of the human population, they all look the same. Out of the "similar looking" stainless steel sport Rolexes, the Explorer II with the white dial is one of the ones that stands out the most. The crisp white dial with the brilliant orange accents is hard to not love. It will be interesting to see how this watch performs in this review compared to the GMT-Master II (BLNR) I reviewed previously. Love me some orange accents. Can Batman save Rolex from Mr. Freeze? Perhaps the most visually enticing aspect of the Explorer II is the orange 24-hour hand and the orange "EXPLORER II" text printed on the dial. It stands out against the white dial and gives the dial that extra pop. So if you are looking for a clean white dial with a small splash of color, look no further. Unlike the other sport Rolexes, the Explorer II features a black frame around the hour indices and black hands with Chromalight. All of this black contrasts the white dial perfectly, making this dial one of the most legible Rolexes out there. It also makes this model more sporty and casual (compared to the usual polished finish)... which is good and bad. It is the less "luxurious" looking sibling. Finally, the date function on the dial is enlarged by the cyclops attached to the sapphire crystal. The dial makes this watch. The high quality Oyster bracelet is not only extremely comfortable (more on this later), but it is also gorgeous to look at... the Oysterlock safety clasp by itself is a work of art. Easily one of my favorite things about Rolex bracelets. The all brushed finish (with polished sides) makes the Explorer II more tool and less dress, which matches its overall theme. Like all Rolex bracelets, the links are connected with a single screw. This makes removing links a breeze! I wish that all watch manufacturers that offer bracelets could learn from Rolex... the best bracelets in the market hands down. One of the best feelings... peeling all the protective plastics off a BNIB Rolex. The Explorer II comes with the COSC manufacture 3187 movement with a bidirectional self-winding rotor. This movement is also equipped with a paramagnetic Parachrom hairspring and Paraflex shock absorbers, giving the watch additional magnetism and shock protection. During my short time with the watch, time keeping was spot on. Thanks to the black frames on the large round hour indices and black hands, telling time against the beautiful white dial is an easy task. The bright orange and over-sized 24-hour hand is easy to identify and distinguish from the other hands. At night, the watch is just as easy to read because of the use of Chromalight that is applied to all hour indices and hands. One of the most legible Rolexes. The crown, hands, date, and bracelet all function like they should. The crown is easy to operate. The Explorer II comes with a nice list of features: orange 24-hour hand, fixed 24-hour graduated bezel, water resistance to 100m, date function, sapphire crystal with cyclops lens on the date, screw-down crown (with twinlock system), and COSC manufacture 3187 movement. Interesting to note that the twinlock system on the crown from the Explorer II has the same 100m water resistance rating as the GMT-Master II (which has a triplock system on the crown). Water resistant enough for Aquaman? Most, if not all, Rolex bracelets are extremely comfortable to wear. This bracelet is no exception. Aside from the micro adjustment on the clasp, there is also an Easylink extension that works perfectly on those hotter days. The curved links also ensure maximum comfort on the wrist. With a retail price of $8,100, the Explorer II is only $350 less compared to the GMT-Master II (116710LN) and priced the same as the Omega Seamaster Planet Ocean GMT. As beautiful as the Omega is... I would without a doubt go with Rolex if their prices are the same. Considering Rolex's indisputable brand recognition, timeless designs, and strong resale value, almost any sport Rolex is a safe purchase and a good value all things considered. The hard part is picking which sport Rolex to purchase first! You had me at white and orange on the dial.